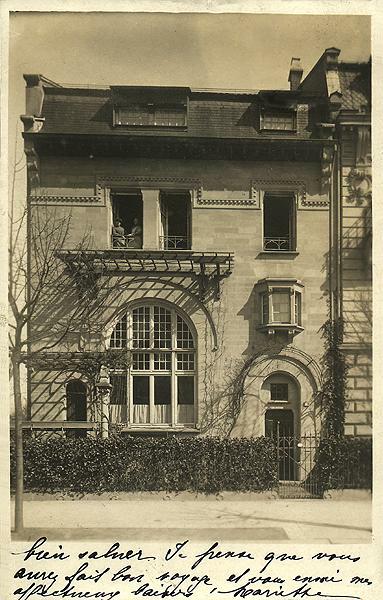 As art nouveau just begins to arrive to Strasbourg, Gustave Krafft builds here his own mansion, delivering by that way the result of his latest ideas about architecture as we can see it on a period document(1). The façade, rather restrained, is quite surprising if we compare it to the other buildings by this architect. The cornice, as well as the frieze above the the first floors's windows witness some viennese influence. The plan and the former inner inner decoration were conceived according to the ideas of the English Voysey, the latter also calling for the suppression of unuseful decoration of the façades. On the other hand, the small oriel above the entrance door looks like an observation post: is it the latest urban avatar of the medieval look-out turret? 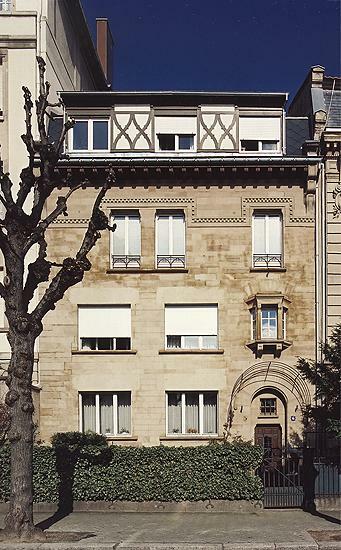 The existing façade has been altered almost beyond recognition. (1) This picture is signed "Mariette", the spouse of Gustave Krafft.